The perfect excuse for weekend getaways. Life is hectic and frenzied with parties and holidays and people coming to visit. A weekend getaway is the best kind of self-care. Great stuff to do, great people to do it with, and room service! Who could ask for more? Los Angeles is a destination for many people. However, for those of us who call it home, the desire to get out of the city peaks in the summer, as the highways clog with beach-going traffic from out of state. Sometimes, we just need to get away from the rush and craziness of LA. I’ve put together these ten weekend trip ideas that will take you away from Los Angeles, and get you back home in time for work Monday morning! 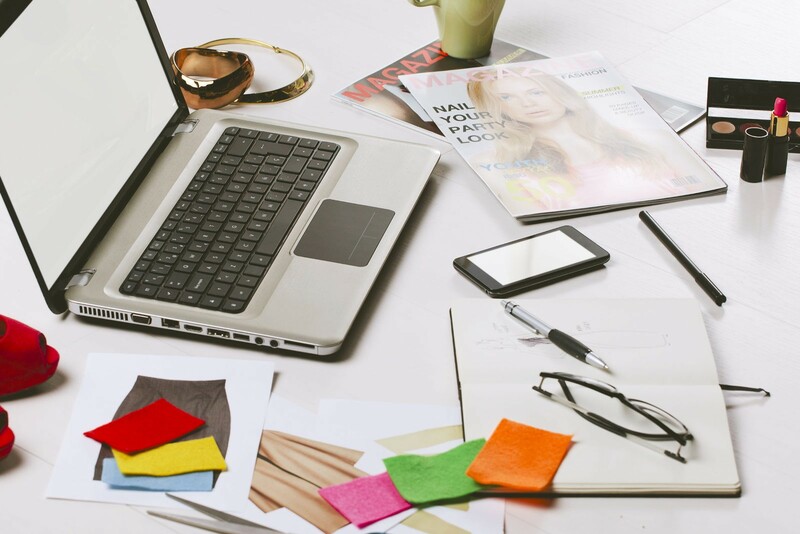 And side note: this post is NOT sponsored by anyone – just some fun ideas for your next trip! San Diego – While San Diego can get crowded during the summer, too, it’s not nearly as crazy as LA gets. While you’re there, visit the Gaslamp quarter for great food and shopping. 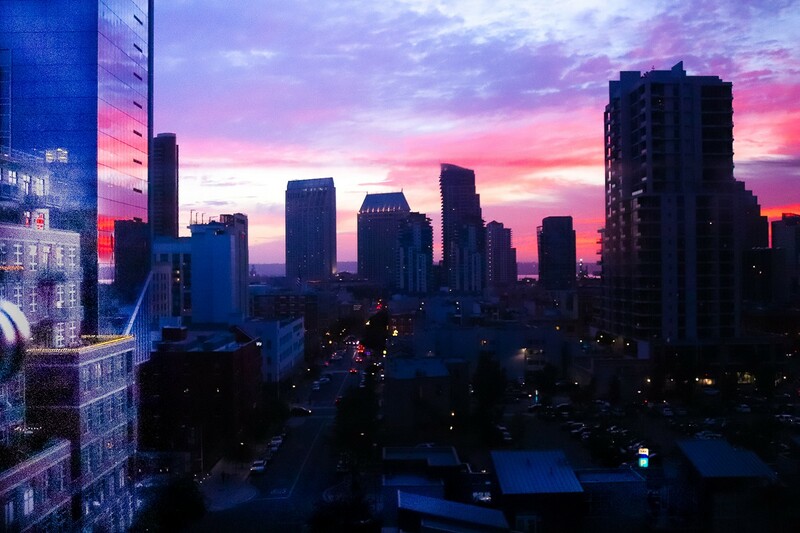 We stayed at the Hotel Indigo near Petco Park for my birthday in April and really enjoyed it. Be sure to book a Dine, Dance, and Cruise on the San Diego Bay for an evening you won’t forget. If you’re feeling adventurous, you can kayak on a guided tour through sea caves, and the hot air balloon rides give you the chance to catch the beauty of east county and the breathtaking views as you head out towards the bay at sunset. Stop by Seal Beach before you leave! Big Bear – If beautiful bodies of water are your thing, head to Big Bear lake. The Castle Rock Trail gives you the chance to get deep into nature. The moderate hike is only a few miles, but is a great way to relieve some stress. The Alpine Slide offers a great waterslide (pencil in a winter weekend here, too! ), and the miniature golf course is a great way to spend an afternoon with the family. Las Vegas – Really, do I need to talk about the splendor of Las Vegas? Whether you head down for a few shows and a spa experience, or want to hit the strip for poker, there’s plenty of ways to spend the weekend. If you’re a foodie, don’t miss the Las Vegas Strip Afternoon Food Tour, sampling food from four world-class restaurants. 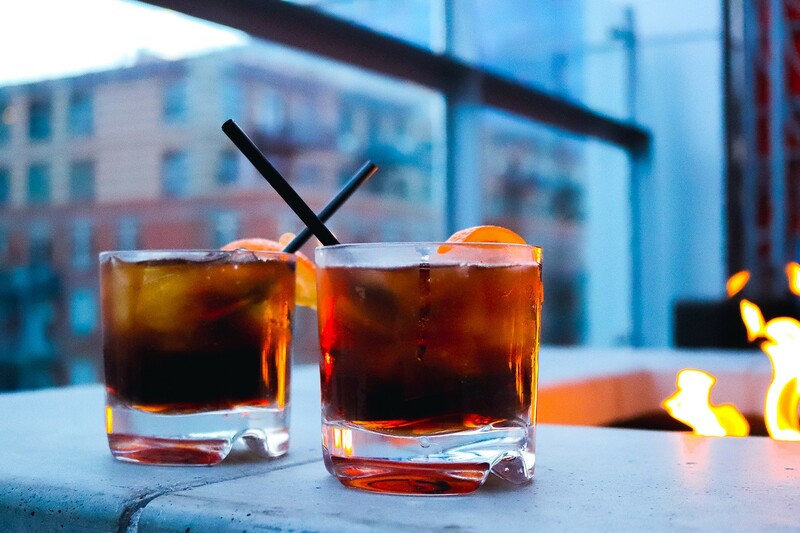 There’s also a variety of boozy outings, including winery tours, chats with craft brewmasters, and the Exclusive Tasting at the Whisky Attic. Lake Arrowhead – An hour and a half east of L.A. lies Lake Arrowhead. It’s the perfect place to get out of the confines of the city, with plenty of fun outdoor activites. The Heaps Peak Arboretum is a walking tour where you can experience native plants that grow above 4,000 feet elevation. The Skypark at Santas Village is open Thursday through Sunday during the summer; they offer bike and equipment rentals, so no worries about toting your bikes from home. The Lake Arrowhead Queen boat ride is a relaxing, information way to spend a calm afternoon. San Francisco – There is, of course, normal tourist stuff to do in San Francisco. But sometimes, straying off the beaten path is the way to go, and San Francisco is just such an adventure. For starters, you should not skip the Haunted San Francisco: Ghosts, Murder, and Mystery walking tour. Catch a show at the historic Fillmore (don’t forget to buy a poster! ), then head to Chinatown for dinner. Sunday morning, grab cinnamon toast at Trouble Coffee. Lake Tahoe – The best thing to do in Lake Tahoe? Get a vacation rental with an outdoor lake view and comfortable chairs, and read that book that’s been in your TBR pile for a few months. However, if you want a little more adventure, check out the Truckee Bike Park, where the trails are appropriate for any level of experience. The Martis Peak Fire Lookout is an eight-mile round trip hike with the best views of the valley from the lookout. Catalina Island – If you’re looking to pack as much activity into your weekend as possible, Catalina Island is the perfect choice! The Catalina Island Conservancy offers guided tours through their botanic garden. You can traverse a zipline through the treetops as you see the island from above. The Avalon Theater is a great way to chill out with a movie after a day filled with adventure. 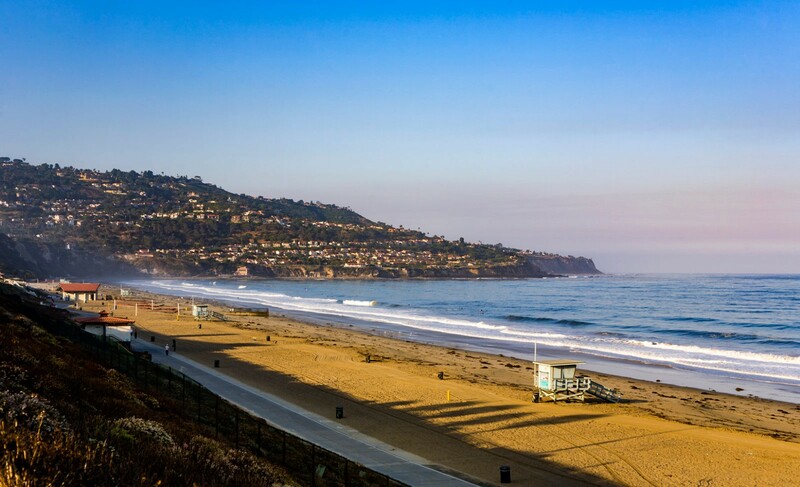 Redondo Beach – Looking for family-friendly weekend trip ideas? Redondo Beach is an ideal spot. Fridays bring free family movie nights, and the classic arcade features quarter games. The beach is clean, and there are bike and skate paths. Pick a spot, throw down a blanket, and watch dolphins playing in the surf. The Seaside Lagoon is fun, too. Take some time to explore Palos Verdes, Hermosa Beach and Manhattan Beach while you’re in the area! Joshua Tree – Joshua Tree is the destination for a camping getaway. Rates are reasonable, but spots may be hard to come by during the peak season (October through May) so you’ll need to book this trip in advance. Once you arrive in Joshua Tree, you can go hiking or enjoy the opportunities for photography. Nearby, you’ll find rock climbing, geology tours, and an old mine waiting to be explored. Or if sitting by a pool with a cocktail is more your thing, check out nearby Palm Springs! Santa Barbara – Check out Santa Barbara for wine tours that are less crowded than the Napa Valley tours. While you’re there, rent a kayak to explore the nearby ocean, and, if you time your visit just right, you can enjoy the fireworks show in the Santa Barbara Harbor. You can find good deals on hotels, flights and excursions on Travel Zoo, Expedia, Travelocity and sometimes I find great last minute hotel deals on this app called Hotel Tonight (that I actually learned about from a Lyft driver!). Escaping the hustle and bustle of Los Angeles is easy. 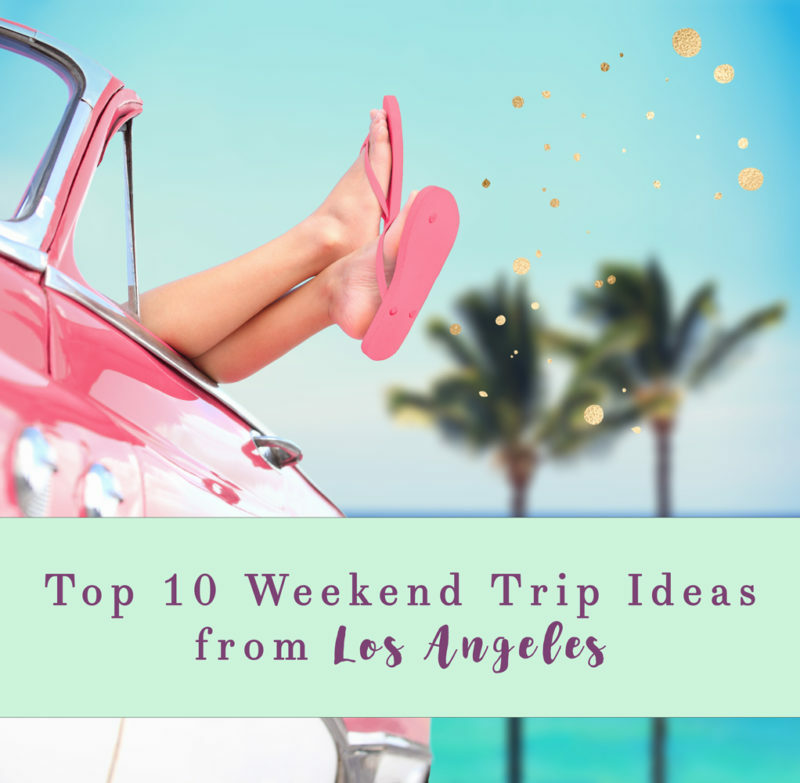 I hope that you take some time to explore at least some of these amazing weekend trip ideas that California has to offer! Even though it’s not a weekend trip for me I’ve been to Reno, Lake Tahoe, Santa Barbara, San Francisco and Vegas. I’d love to go to San Diego next time I’m in CA. I’d love to visit any of those destinations! I’d have to pick one are though because I’m on the East Coast! I don’t live in Los Angeles but have traveled the area numerous times! Joshua Tree is great! I love Laguna Beach too! There are so many cool places to vacation near LA. I’ve always wanted to go to San Diego and don’t know why I haven’t made it there yet. There definitely are so many easy-to-get-to destinations close to LA. Sometimes I just prefer to stay in LA, though, because there is just so much to do here! I’m definitely going to do L.A. and Vegas as soon as I possibly can! Joshua Tree has always been on my list to visit. Great round up! Love your suggestions, been to most of them. My sister got married at Lake Arrowhead.